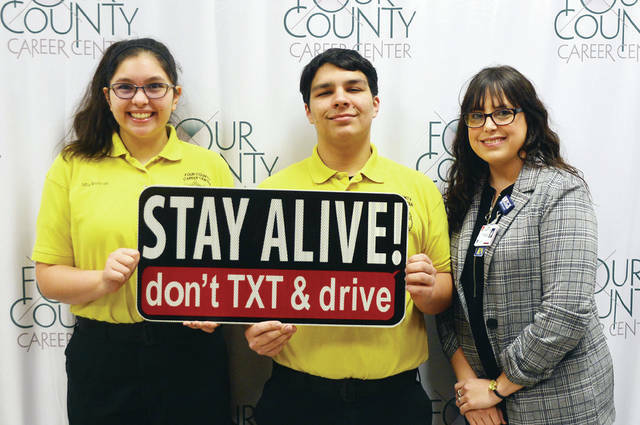 In an effort to help keep students safe at Four County Career Center in Archbold, the University of Toledo Medical Center recently donated “STAY ALIVE! don’t TXT & drive” signs and banners to be posted at the school and given to students to display. Shown presenting a banner to Career Center Law Enforcement and Security Tactics students Mia Beltran and Adam Rohrs is Angela Castillo, UTMC trauma/injury prevention coordinator. https://www.fcnews.org/wp-content/uploads/sites/45/2019/03/web1_FCCC-UTMC-donation.jpgIn an effort to help keep students safe at Four County Career Center in Archbold, the University of Toledo Medical Center recently donated “STAY ALIVE! don’t TXT & drive” signs and banners to be posted at the school and given to students to display. Shown presenting a banner to Career Center Law Enforcement and Security Tactics students Mia Beltran and Adam Rohrs is Angela Castillo, UTMC trauma/injury prevention coordinator.